The latest Lucid Scribe plugin for use with the Wild Divine Lightstone is now available thanks to Michael. This will give my project more flexibility due to the lower threshold now offered, without having to modify the hardware or increase the LED light output to otherwise gain the extra reflected sensitivity. This doesn’t make the previous version of the plugin redundant however. On the contrary, this now gives me the extra option of tailoring the sensor design further should I wish to, including the idea of maybe swapping the photoresistor for a suitable photodiode instead. The latest Lightstone IOM v0.9.9 plugin is now available from Lucidcode here. 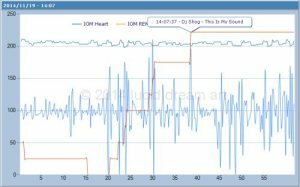 Hello, how can i add an audio to Gsr for biofeedback? Do you want an audio track to play when the GSR channel goes over a certain value? Thanks, i would have an audio note for gsr track; when grs value change, also do the tone pitch. (like a wha wha). So when i’m going in a deep relaxation, the tone become low, if i become more stressed the tone go up. The GSR channel cannot currently trigger audio tracks… will see what I can do in one of the next updates. Thanks, iom grapher work done for coherence, but in not possible set anything. Mind Workstation work done but is not free, you can set audio for grs track, but it have 2 values. Relax level and Stress level, but there’s no value.